This year our staff sustainability engagement programme has a fresh new feel; we are pleased to announce the launch of the c-change challenge! Staff across all campuses are encouraged to get involved and form a team, who together will work on monthly challenges and compete against other teams throughout the university! This year there will be 7 monthly challenges between January and July, with the awards event taking place in August. 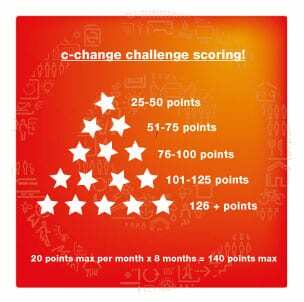 How does the c-change challenge work? Starting in January, we will reveal a monthly challenge to the university. Each monthly challenge will focus on a different sustainability theme, e.g carbon, travel, reuse, recycling and water. Each challenge will have a number of actions for teams to complete. Each action will be worth a certain number of points depending on the level of difficulty. Teams are encouraged to complete as many actions during the month as they can, to earn as many points as possible and climb the leaderboard! Teams do not have to participate in every monthly challenge, they can dip in and out and choose the challenges that they would like to tackle. As well as contributing to the university’s commitment to sustainability, the challenges will give you the chance to meet new people within your department, encourage your colleagues to think about sustainability, and work with others from across the organisation. Teams will be competing for their position on the prestigious leaderboard and ultimately to win the most points overall – because as we all know, points mean prizes! Ready to sign up?! Please fill out this form to register your team. Experienced teams can take part in an Extra Mile Project. These can be any activities, campaigns or events, organised by a team, which has a positive impact on the environment. For more info see the Extra Mile guidelines on the resources page. Get in touch with the c-change team if you’d like to participate in an Extra Mile Project. Please find all our helpful c-change challenge resources here. So without further a-do, lets get started!! The actions for the APRIL challenge are below. Please only submit the form ONCE at the end of the month. Good luck challengers! Useful resource: Poster, email. Tip: when possible, natural daylight should be used instead of lights, as lighting can amount for up to 40% of a building’s energy usage.